1. 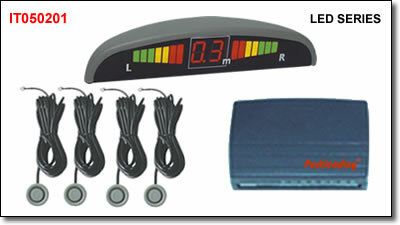 No display, warning distance by "be.." sound according to the distance between car body and obstacle. 2. Suitable for 2~4 sensors. 3. Acoustic signal increases in frequence when obstacles move closer. 1. Digital display is intuitionistic, compatible with indicator light, helps drivers know about the obstacles and warn them of parking. 3. To display with double wave bands and digits. the obstacles and warn them of parking. 1. System activated automatically when reverse gear is engaged. 2. 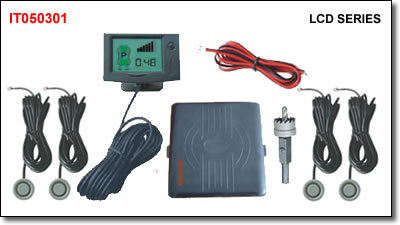 Detection distance 0.10m to 3.00m. 3. 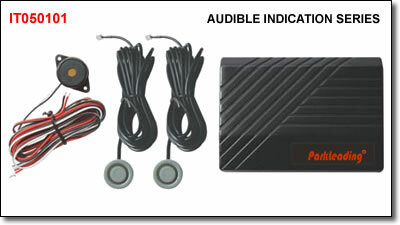 Acoustic signal increases in frequency when obstacles move closer within 1.50m. 4.Volume Hi, Low, Off optional for acoustic signal. 5. 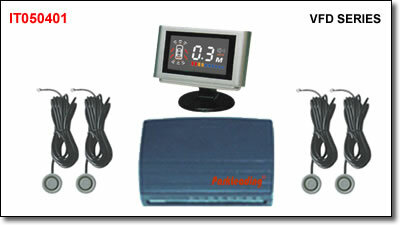 Numeric display from 3.00m to 0.35m. 6. 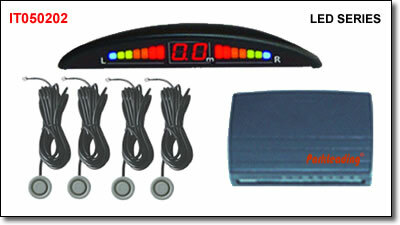 7 LCD lights under 3 color cover (green, yellow and red) turn on in order when obstacles move closer within 1.50m. 8. Suitable for 2,4,6,8 sensors. 1. 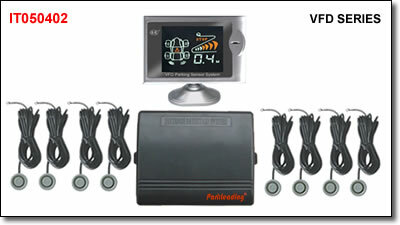 The appearance of VFD (Vacuum Fluorescent Display) is more colorful and vivid, giving a luxurious looking to your vehicle. 2. Detection distance 0.3m to 2m. 3. Acoustic signal increases in frequence when obstacles move closer within 1.5m. 4.Volume ON, OFF optional for acoustic signal. 5. Suitable for2, 4,6,8 sensors. 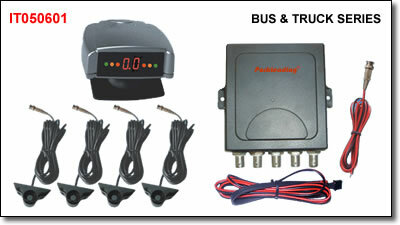 1.Front sensors start to work upon ignition of engineRrear sensors are activateed when vehicle in reverse. 2.Brake activation function for front sensors is available. 3. The appearance of VFD (Vacuum Fluorescent Display) is more colorful and vivid, giving a luxurious looking to your vehicle. 4.Detection distance 0.1m to 3m. 5. Numeric display from 3.0m to 0.3m. 6. Suitable for 4,6,8 sensors. 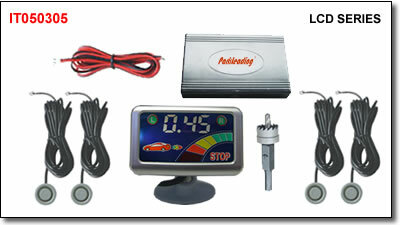 with indicator light,helps drivers know about the obstacles and warn them of parking. 3. Suitable for2, 4 sensors. 3. Suitable for2, 4,6,8 sensors. 1. Sensors and backup camera start to work automatically when reverse gear is engaged. 3. 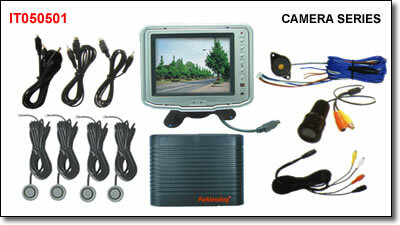 Numeric distance indication from 3.0m to 0.35m with video image on TFT LCD monitor. 4. Acoustic signal increases in frequence when obstacles move closer within 1.5m. 2.Detection distance 0.1m to 3m. 3. 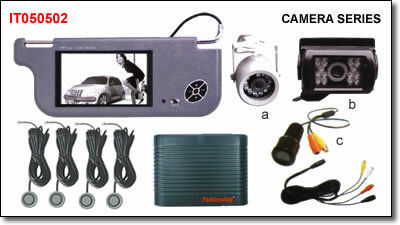 Numeric distance indication from 1.8m to 0.3m with video image on TFT LCD monitor. 6. Type a,b,c optional for camera. 2.Detection distance 0.1m to 5.0m. 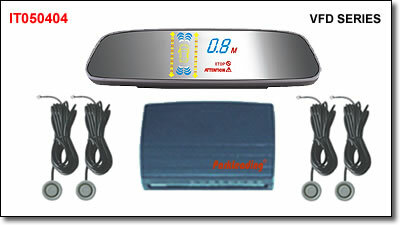 3.Wireless connection between display and ECU. 5.Acoustic signal increases in frequency when obstacles move closer within 1.5m. 6. Volume Hi, Low, Off optional for acoustic signal. 7. Numeric display from 5.0m to 0.3m. 1. Detection distance 0.1m to 2.5m. 2. 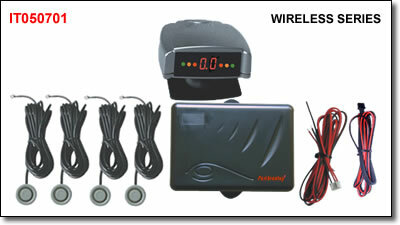 Wireless connection between display and ECU. 3. Acoustic signal increases in frequency when obstacles move closer within 1.5m. 4. Volume Hi, Low, Off optional for acoustic signal. 5. Numeric display from 2.5m to 0.3m. 6. LED lights on two sides in 3 colors of green, yellow and red turn on in order when obstacles move closer within 1.5m. 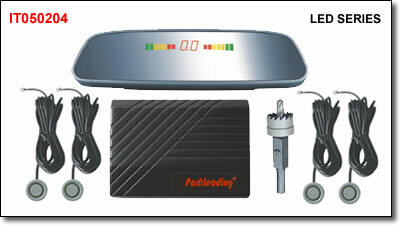 Damage to the bumper of your car from parking mishaps can run to thousands of dollars.“ParkLeading” by IFTIM is the ultimate tool to protect your valuable investment. Modern cars with high rear windows, busy streets and tight supermarket car parks can make parking an unnerving experience. But with "ParkLeading" by IFTIM, you can confidently squeeze your car into the tightest of spaces. 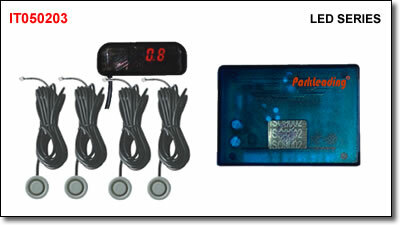 As you reverse, sensors mounted discreetly into your bumper will transmit ultrasonic pulses. These bounce off an obstacle and send echo signals to the control unit for evaluation. 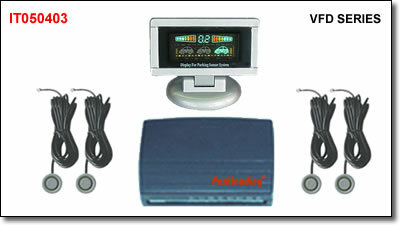 Inside your car, the small display unit will warn you of an object's distance via coloured LEDs and a varying tone. 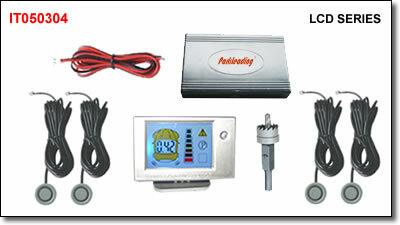 Control unit, 2,4 or 8 ultrasonic sensors, visual-acoustic warning module, mounting accessories, wiring harnesses, installation instructions, operating instructions and safety notice. Display, display module bracket, sensor, sensor wiring harness, control unit, system wiring harness, display module extension wiring (length 1.2 x 1.5 m).